The Tete a Tete range is famous for variety and choice, and this particular model offers plenty of good options. 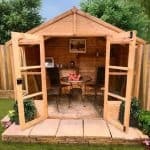 This model is 6ft in depth and 8ft in width and is a traditional summerhouse. The building is also robust, due to the fact that it has 11mm tongue and groove in the walls. This thick cladding allows for plenty of robust protection against the elements in the colder months ofthe year. 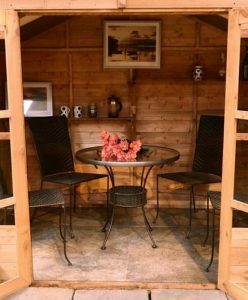 The summerhouse has options when it comes to flooring, with the choice between a solid sheet floor or a tongue and groove floor. Ideal for lounging about in on a summer’s evening, the building has striking wrap-around windows that let in plenty of light. The windows are large and are made using styrene material. There are eight windows to create a pleasing visual effect and provide plenty of light. A solid sheet roof is protected by a mineral felt covering, and there is the option to treat the building with treatments that BillyOh sells. 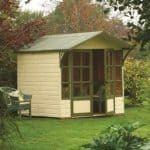 We are fond of the Tete a Tete range of summerhouses, because it simply offers such a wide variety of sizes to the consumer. Why is this important? 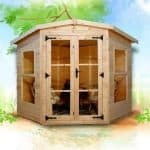 Well, so many summerhouses by other manufacturers throw in a couple of size options and leave it at that, but BillyOh has created the perfect custom feel for this range. This custom feel matters if you have a garden that has an unusual shape, or is smaller than the average plot. Here, we have the 6 x 8 model of the Tete a Tete, which is nearly the biggest width the Tete a Tete runs to (after this you’re looking at the 10 ft model) and there is decent depth on this one too, at 6 ft. So there is plenty of room here. And like all the other Tete a Tete models, there is solid 11mm thick tongue and groove timber in the walls. This cladding is solid as a rock,and absolutely perfect for this size building. You’ll receive plenty of insulation, and also a lot of solidity. Here at WhatShed? we love tongue and groove mainly because of the excellent durability it has, but there are other perks here too. Give it a lick of paint and this building will look fabulous, simply because tongue and groove is smooth and attractive. So what else does the Tete a Tete bring to the table? Well, it doesn’t have any flooring on the standard model. You can buy a base through BillyOh or you can have it on a perfectly flat concrete surface if you don’t actually want a floor for your building. There’s some versatility here, which is a bit of a trademark of BillyOh. If they can give choices, they will. With the Tete a Tete range you can upgrade to a solid sheet floor or go even further and buy a tongue and groove floor from BillyOh. 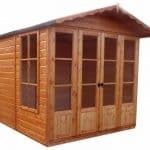 Tongue and groove gives the maximum stability out of these options here, and allows you to have a summerhouse that you can place heavier furniture in and generally jump up and down on the floor to your hearts content without fear of breaking it. The Tete a Tete also has that wonderfully attractive wrap around effect on the windows. You get eight individual windows here that take up much of the wall height, so there is plenty of light inside the building. 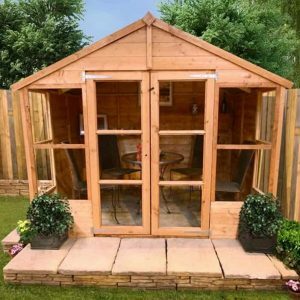 Perfect for enjoying a great iced tea in the summer. 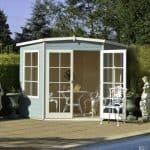 We trust that most people will be looking at this as a large summer house rather than a home office, for example. And this would be a good move, because while those windows are large, they don’t have double glazing in them, or even glass. Instead, you have styrene, which is incredibly tough, but won’t match the insulation of double glazing. It’s not necessarily a cold building, but don’t expect to use it in the winter. 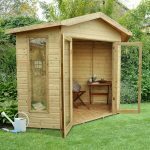 So those home office plans will not work with this unit. The windows are fixed too, which we would expect at this price point, but a couple of openers would have added immense value to the purchase overall. That’s what we think anyway. We always like to have more than the door as a ventilation option. The roof works out pretty well, and we liked what BillyOh has done here. They’ve provided a solid sheet roof, which is strong and will provide good protection against the rain over time. But on top of that they’ve also provided mineral felt, and this is a good solid felt covering, better than the sand felt you find on other buildings. Like every building, treatment is essential if it’s going to survive its first year with its looks intact. BillyOh present their usual fare, with good choices in standard treatment (four colours) as well as eight premium paint treatments that look fantastic. BillyOh has created a reasonably large building here, which could in theory house a home office. But the lack of of any decent glazing option outside of styrene means that you’re looking at a summer house that is literally meant for the summer. This is no bad thing, and we can see it being the perfect spot to enjoy a cold drink on a summer’s evening. 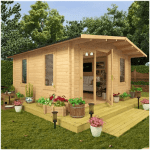 A nice little summer house, it has the potential to be a great place to spend some time in. The 11mm cladding backs all of this up, and there is lots of quality in the building overall. Tongue and groove helps here. But you also get other aspects, including the mineral felt on the roof that adds even more longevity. This has plenty of width and this makes for an excellent little place to spend time in. There is enough room in here for a cosy little place to escape. 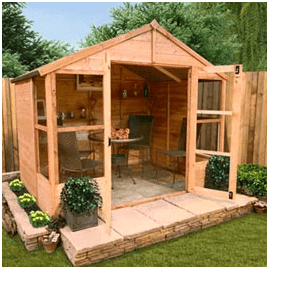 This is an extremely simple building to put together, with no fiddly bits to bother you. Take two people onto the job and you should find it is up within two days. Excellent value for money. 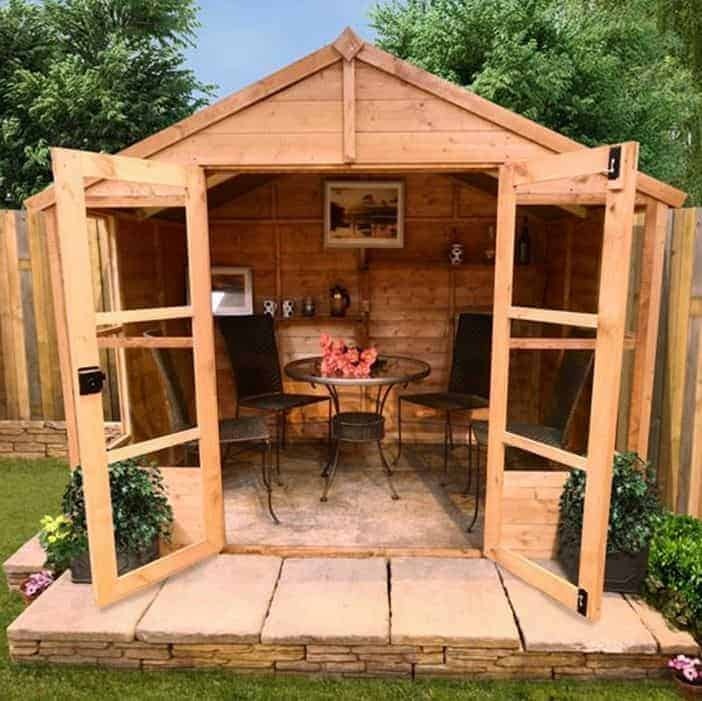 We would add a couple of extras here and there including that tongue and groove floor, but as it stands it is a great little summer house. Final Thoughts: This is a great range, and there is plenty in this model to like. The width is the real selling point here, and it is one of reasons why it is, we think, one of the best in the range for the price. We liked various aspects here, not least the fact you get tongue and groove cladding. The styrene is an issue to us but it is only because we want to use every garden building under the sun all year round. You may not, so not having glass may not bother you too much. It’s up to you how you use the building but we would recommend thinking about styrene and its suitability for your needs. Other than that, this is a great building with excellent space and lots of strength.